I will do the first step to replace the old battery by a new one before doing further studies on that. I will target to a higher failure rate device (battery). As for which one has the problem, I would say it has to be the battery. Rechargeable batteries of all types are known to have similar characteristics, one of which is discharging the batteries to maintain good rechargeablility. At least one person has demonstrated this for the Scooba battery in the roombareview.com forums when he brought a "dead" battery back to life. He allowed the battery to slowly and completely discharge using a 12-volt automobile bulb, followed by recharging the battery on the Scooba external charger. This procedure brought his "dead" battery back to a full charge! However, other forum members have reported that many have experienced problems with Scooba battery life, and that as a consequence of this iRobot will replace your battery if you call them and report a short-life battery problem. You can contact iRobot at (800) 727-9077 if you would like to report a battery problem and request a replacement. Why buy something used that is not in perfect operating condition? There may be other problems yet to be discovered. 1) test the batteries very well in another device. 2) test the charges if working properly. 3) test the power inside from scuba, some electronic components like diode, or capacitor is draining the batteries. repair or rreplace. Have Scooba 340 that won't power on after battery fully charged! No repair services anywhere, unfortunately. It does sound like you might need a new battery, but the issue could also be the power button. I suggest giving us a call at 1-877-855-8593 so that we can more accurately determine what the problem might be and how we can most efficiently help you to solve it. Remove and clean all of the wheels, and make sure the cliff sensors under the bumper are clean. Tap the bumper with your hand-- really smack it a couple of times. It sounds like the Scooba believes it's stuck against an obstacle. It sounds like you've got a finicky power button. Not a lot that can be done about that, but you may want to try getting your hands on the old-style Roomba remote, the black one. The power button from that will power on a Scooba, though you can't start a cleaning cycle that way. This might allow you to bypass the Scooba's power button altogether. his morning, I turned on my Scooba and it started beeping a scale of tones and blinking all its lights in sequence. After an hour or so of resetting, cleaning, disassembling, researching, and scratching my head, I stumbled across the solution on Roomba Review. But, for me at least, it was even easier than all of that. I don't have any of my own pictures for this procedure, but it's pretty straight forward. Remove the battery and power. Remove the two screws holding the bumper shell in place and remove it. Carefully peel up the sticker with the control buttons on it. This sticker is actually the control panel. There is a data cable attached to it just below the "Clean" button. Be careful not to break it! Gently replace the "sticker" (i.e. control panel) and make sure it's completely flat. Check to see if it works again. If not, repeat. Scooba circles and only goes backwards. my new iRobot Scooba model 5800 will not let the water onto the floor. Everything seems to be in place and fully charged. It moves as if cleaning,but no water comes out. This is first time use. Received for Christmas. 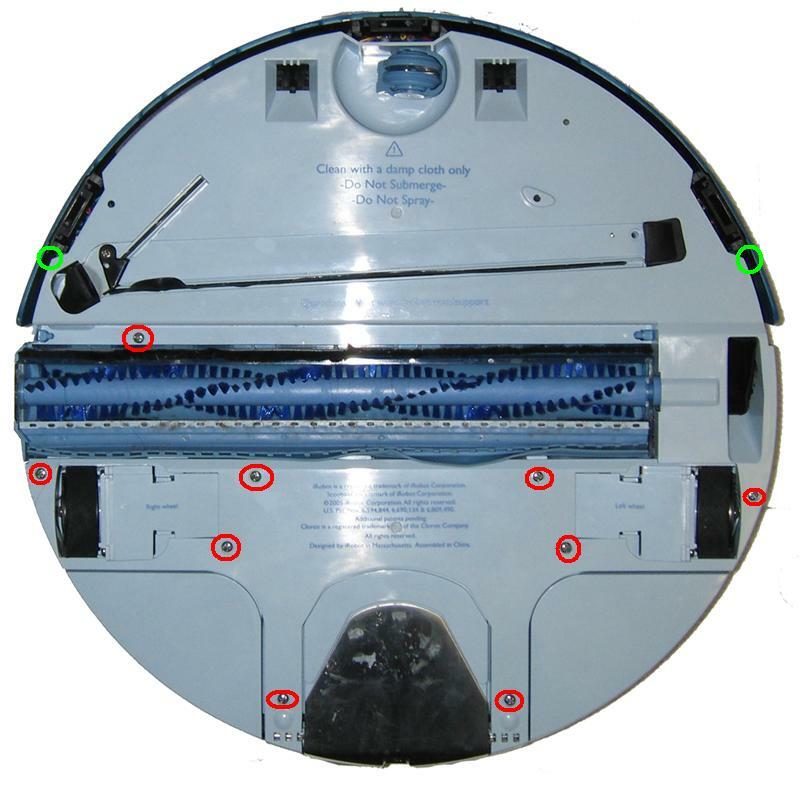 Have a manual for iRobot 5800 Scooba Vacuum?